Product Dimension : 18" x 25"
Set Up : FREE for standard imprint color. For other colors see Extra Charges information. FREE for standard imprint color. For other colors see Extra Charges information. 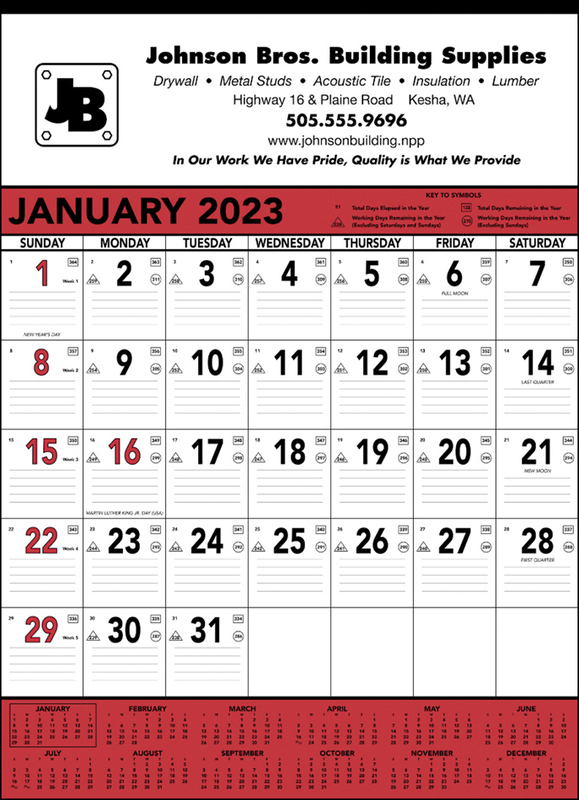 This Black & Red Contractor Calendar is a giant planner used in most industries. The large Date blocks contain faintly ruled lines along with symbols denoting the days elapsed and remaining in the year, work days remaining without Sunday & Saturday and work days remaining without Sunday. Tinned top with plastic loop for hanging. Standard imprint color is BLACK. Free Set-up for Black imprint. Additional charges apply for imprint colors other than Black. Multi-Color or Full-Color imprint available.